Among athletes, knee ligament injuries are very common. Some are relatively minor, but depending on the particular ligament injured, symptoms could include pain, tenderness, swelling, difficulty walking, instability, or a popping noise. In more serious cases, your knee may even give out when trying to stand or walk. Should your symptoms reveal a severe ligament tear, it may be necessary for you to undergo arthroscopic reconstructive surgery to replace the torn ligament with a substitute graft. The most common type of ligament reconstruction is of the Anterior Cruciate Ligament (ACL). The physicians at Guilford Orthopaedic utilize the most advanced technology in ligament reconstruction, and will work closely with you to determine your best options in relation to your ligament injury. 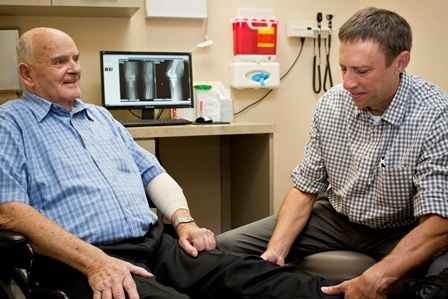 Together with our professional physical therapy staff, we can help you regain full motion and use of your knee. Read more on Knee Ligament Reconstruction by clicking here.